Past studies have shown that if you have diabetes, you are more likely to be diagnosed with Alzheimer’s disease when you get older, and having diabetes even accelerates the Alzheimer’s progression. Why? The complete answer is unknown at this time, although many theories have been culled from many different studies. Professor Miranda Reed, Assistant Professor in Behavioral Neuroscience at the West Virginia University Department of Psychology, hopes to take a step in finding the answer to this question, as well as in helping to find the best treatment of the two conditions. Funded by the Alzheimer’s Association, with a grant of $97,000.00 for research, Dr. Reed will attempt to find the answer to “why” having diabetes increases the odds of developing Alzheimer’s disease. When that answer is finally answered only then can steps be taken to create a medication(s) for these two different diseases at the same time. Dr. Reed is creating a mouse model that has both diabetes and Alzheimer’s disease. At this time, it is unknown whether the medication for Alzheimer’s has the same effect on a person with just Alzheimer’s as it does on those who have Alzheimer’s and another disease. This mouse will help Dr. Reed in understanding the neurological progression of both diabetes and Alzheimer’s. 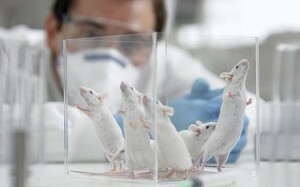 In this study, the behavior of the mouse, the brain functions and treatments will be conducted in a controlled environment. From the data collected, she will be able to tell the experiences of mice to humans so that there is a more clear understanding between diabetes and Alzheimer’s. Dr. Reed hopes to answer some of the questions that are now revolving around the current treatment for Alzheimer’s in conjunction with the current treatment of diabetes. As people get older, their likelihood of developing diabetes increases. Also with age, their likelihood of developing Alzheimer’s increases. According to Dr. Reed, most people who have Alzheimer’s disease also have an additional disease, and in many cases this additional disease is diabetes. Dr. Reed will focus on the treatment of and the management of these two diseases together. Currently, it is an unknown as to whether or not the medications used for the treatment of Alzheimer’s works in the same manner on a person suffering with just Alzheimer’s as it does on a person with both Alzheimer’s and diabetes. Dr. Reed’s study might provide answers as to how the different medications for one disease might affect the other disease that a patient has. This new information could lead to a better understanding of drugs that need to be created and eventually distributed to and used by the general public. Assisting in Dr. Reed’s study will be two graduate students, Holly Hunsberger and Carolyn Rudy, who are at the Behavioral Neuroscience Program at the university. This entry was posted in Diabetes News on November 27, 2012 by admin.